At the recent National Action Network 25th anniversary conference, I was honored to participate on a panel of NNSTOY* teachers and university professors moderated by renowned journalist and host of TVOne’s “NewsOne Now,” Roland Martin. The topic, Saving Tomorrow Today focused on some of our serious educational concerns and highlighted the urgent need for community involvement in schools. Roland Martin’s reputation and expertise are recognized worldwide. So, I knew he was going to pose insightful questions and prompt us to concisely address the issues. As a product of South Bronx public schools, a career math teacher, the founder of a scholarship foundation**, and a clinical psychologist, I was excited but anxious, in anticipation of a discussion facilitated by such a renowned personality as Roland Martin. My anxiety did not last long. From the onset, Martin displayed a both a thoughtful manner and a down-to-earth approach. “Ok, I’m about to get in your business,” he warned the audience. Martin then asked if anyone speaks up after family gatherings where they notice that some of the children appear to be behind. I contained myself from shouting, “Amen!” as I could personally relate to this sad fact. Reaching out to academically guide or support our relatives’ children can be an emotionally complex task that often puts us at risk of enduring defensive and angry reactions. There were many times when I noticed that Roland Martin and I were on exactly the same page. For example, when he solicited concrete, immediate strategies for Saving Tomorrow Today, I suggested that we be encouraged to look back at our past with pride. For example, in the past, community involvement in historic Southern schools was common because teachers lived in the same neighborhoods and attended the same churches as their students. In those environments, students thrived. During the discussion, I reminded the group to look around at existing outstanding schools where the community is invested and involved such as P.S. 46 in Harlem. Roland Martin also highlighted the significance of our history and recommended the following book: The Education of Blacks in the South, 1860-1935, by James D. Anderson. Reading is a passion that Roland Martin and I share, and we both stress its importance beyond the confines of the school building. The children in his family are required to always read during their trips with him. In fact, he no longer has to remind them. They approach his car with their books saying, “We know, we know!” Similarly, my 4-year-old great-nephew now refers to me as Aunt Pat Library, because for as long as he can remember, we have always gone to the library for play dates. As the event came to a close, the Q and A included questions about parents who don’t understand the curriculum. I described my mother, who earned a GED after I completed college. She couldn’t help me with my homework, but she made sure I completed it. She earned low wages as a babysitter in the projects, but she did a professional job of instilling educational values as she cared for the neighborhood children. The panel went on to assure the audience that parents don’t need to master the curriculum content, but it’s important that they are aware of resources available for helping their children. I was inspired by Roland Martin and by the other valuable contributors on the panel and in the audience. Together we presented a variety of impressive community and pedagogical strategies for Saving Tomorrow Today. I’m looking back, I’m looking around, and I’m optimistically looking forward. 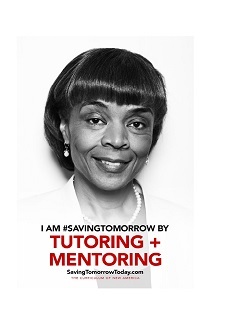 View the Saving Tomorrow Today discussion.